I just needed to post this. This 1932 Ford coupe body and chassis was picked up at our shop on July 13, 2018. 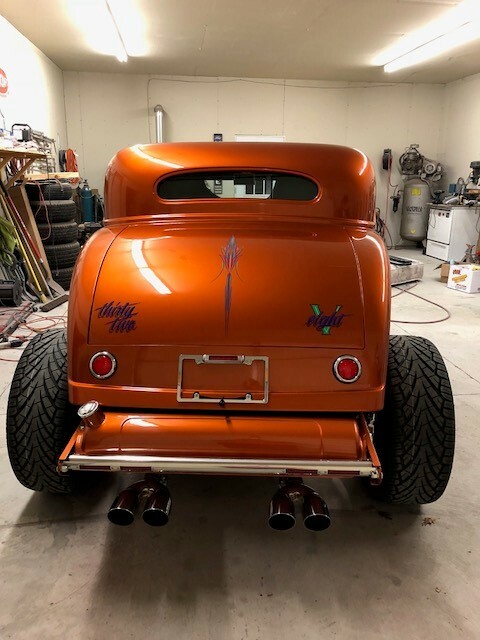 Dana sent me these pictures on October 11, 2018 in just 12 weeks this car is nearly finished and was built in a house garage by 2 retired guys. I am just amazed!!! The couple will be taking it to their brand new baby to Florida at the end of November to it's winter home. This is the second Outlaw that Dana and Clair purchased from Outlaw the first was in 2007 it was 34 Ford coupe. Drove it for years, sold it but God love her Dana just needed another Outlaw. I just hope they have just as much fun with this one as they did with the first. NICE job to those two retired guys. On another note - Before buying a car that you are told is a Outlaw please check with our office first we can give that locations of the body and chassis serial numbers. There are so many Brand X's out there that the owners are trying to sell them as Outlaws. PLEASE BEWARE!!! If it doesn't have our issued OP numbers it's not a Outlaw.